to carry all my love for you"! Hearts a'plenty and oh so beautiful Suzy, sending love around the world. As always it's a true inspiration to see your work. I love hearts like you! The silver lace one is very beautiful, and the laces ones too! Beautiful hearts! Have a wonderful Valentine's day. You have a wonderful collection of hearts, Suzy, they are all so precious. Your latest heart is, well, I don't know what to say really, it touches my heart, it is soooo beautiful. love everything ~ it is all so beautiful. Hi Suzy! Yay! You were able to link up!! And your hearts are so lovely! Hope you'll have some more pretty whites to link up in the weeks to come!! Thanks so much for joining in! Very beautiful hearts Suzy! I love. Wishing you many more beautiful hearts! Happy Valentine's Day! Always beautiful and inspiring, Suzy. all your hearts are gorgeous:) Have a Happy Valentine. what a really beautiful collection of hearts-my absolute faves are the hand made ones!!! 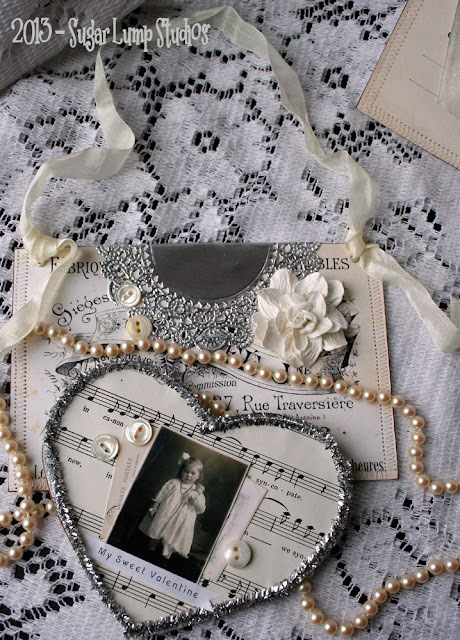 I've been following Nancy's daily heart tutorials/projects on her blog each day.She does make the most gorgeously vintage projects! Your hearts are very beautiful. I love your recent one. Very romantic with the velvet and lace combination. Happy Valentine's Day! Stunningly gorgeous hearts Suzi! Loving all the lace and touch of color you add to them. I love making hearts as well. Yours are just heavenly. Have a wonderfully happy Valentines day! They are beautiful! I love making hearts also!Happy Valentine's Day to you! hello dear Suzy, your hearts are gorgeous! Love all the laces. And the key with the ribbons, so beautiful. 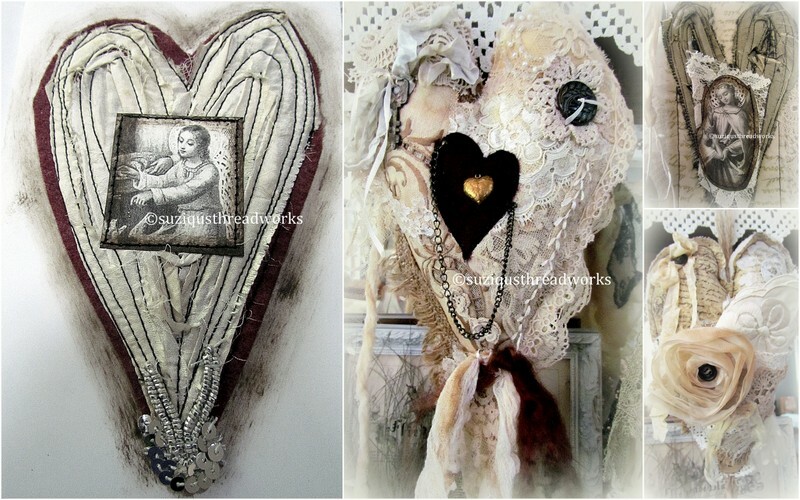 your collection of hearts are lovely, and the last one made by you, is a little wonder in mixed media art. Such beautiful materials and such awsome and amazing heart. It is stunning Suzy. Such a beautiful post with the most gorgeous photographs of your creations (and gifts). Thank You for sharing such a special post with us. Beautiful post, full of lovely hearts! Everyone special. And your Nancy heart is fab too! What a sweet vintage look! I don't know what it is about creating Heart themed projects, but I love it! I have been making heart crochet banners....and now you've put me in the mood to want to sew some laced heart pillows. Your work is stunning. Thanks so much for inspiring. You hearts are so amazingly gorgeous...I just LOVE them...all of them...and love your own personal heart. You put your love into each piece you make and it is obvious. Hope you have a wonderful day! I love your hearts, Suzy! Well, anything that you do! You have such a whimsical and free spirit that shows in these many hearts. Hello my dear sweet Suzy, All your heart creations are very beautiful and romantic and I especially love your latest heart. It's totally gorgeous and has so many different bits and pieces to look at. Your fabric and paper dolls are amazing as well. Their dresses are very pretty and the gypsy look is wonderful. I checked out your other creations that I have missed also and as always they are fabulous. You've been very busy creating lots of eye-candies, dear friend. I'm very sorry that I've been absent for so long. Even though we still have electricity problems, I hope to be a more frequent visitor again and will send you a message soon. Dear Suzy ~ Thank you for sharing your heART(s) so freely and beautifully. May you continue to feel the Love that is all around you! I love all your hearts and could live with them all. You are one talented lady my friend. Sending you a heart full of hugs this day. Hope you Valentine is good to you tday. Oh Suzy...I am loving the newest heart you have made (I love them all)It is soooo amazing and just dripping in beauty. I am so glad you shared the link to Sugar Lump Studios. I will pop over and see. I hope that you are having some breathing room after your time with the fires and that you can enjoy the rest of your summer my dear. Winter is still here with overnight temps in the teens F. But it warms up nicely to 30F. during the days. Happy Valentine's Day Suzy~ Sending you Big Hugs! Oh, I'm thrilled again! On your blog, there is always so exceptionally beautiful works of art to see. The hearts are really quite delightful and charming, dear Suzi. Absolutely gorgeous! Wonderful, wonderful hearts Suzy - so lovely and so inspiring to see them all together like this. You have a wonderful talent for combining lace and velvet and buttons etc. to create something stunning - always such an inspiration! I'm just a bit (!!) late in sending my Valentine's wishes your way, but it's never to late to send love...right? 'Love'ly images! A those beautiful hearts - love in abundance!!! I'm late too - caught up with the mundane sadly!!! Life has been very busy. We're off to the beach now for the weekend - long walks, reading and great planning time for me! LOVE your Etsy Quilts! Inspirations!